This illustration shows a sail ship moving out to interstellar distances. Image uploaded on Aug. 16, 2013. Sail ships might be the spacecraft that first take human technology to distant stars. Giant sails propelled by the sun's or a laser's energy could be the most viable option for interstellar spaceflight in the not-too-distant future, James Benford, a physicist associated with Icarus Interstellar, a non-profit group devoted to finding a way to travel to another star system, said during a panel at the Starship Congress conference in August. Rockets won't do the job "because we haven't gotten fusion yet," Benford said. "Beyond that is antimatter rockets that suffer not only from a very difficult design problem, but the absence of the fuel." That leaves sail ships. "I would say that I think sail ships are going to be the first starships, because we know how to do it," Benford said. A solar sail in space works almost like a ship sailing on the seas. Engineers can use photons emitted by a star to both propel and steer a spacecraft. 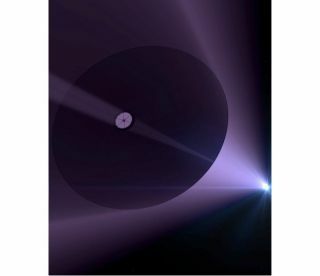 Benford also has been working with laser technology to gather more information about how to propel sails outside the solar system using a "beamer." The structure would use lasers, or perhaps microwaves, directed on the sail to push it ever farther into deep space. An extremely lightweight 62-mile-wide (100 kilometers) sail unfurled close to the sun could make an interstellar voyage in 1,000 years, said Les Johnson, deputy manager of NASA's Advanced Concepts Office at the space agency's Marshall Space Flight Center in Huntsville, Ala.
"For you and me, 1,000 years is a long time," he said. "But don't forget: There was civilization 1,000 years ago; there was record keeping 1,000 years ago … We don't have the capability of building this today — but if we were [launching a mission], certainly someone would turn on the radio transmitter and listen for the data to come back in 1,000 years." NASA is planning to launch a spacecraft equipped with the world's largest solar sail in November 2014. The Sunjammer — named for a solar-sailing ship in an Arthur C. Clarke short story — will be used to monitor space weather and to demonstrate how this advanced technology could be used in future missions. Although it will be the largest at about 124 feet (38 meters) on a side, NASA's Sunjammer won't be the first solar sail to fly in space. In June 2010, Japan's Ikaros probe unfolded its 46-foot-wide (14 m) solar sail and became the first spacecraft to cruise for interplanetary distances using sunlight alone. Solar sailing isn't new; in fact, it's been around for half a century, Johnson pointed out. "It was first demonstrated in space — that I'm aware of — with the big echo balloons that were inflated in space in the early 1960s by NASA — big, reflective Mylar-type balloons," he said. "And because they were spherical, symmetric, you didn't have any control ability, but essentially, these looked like perfect reflectors."